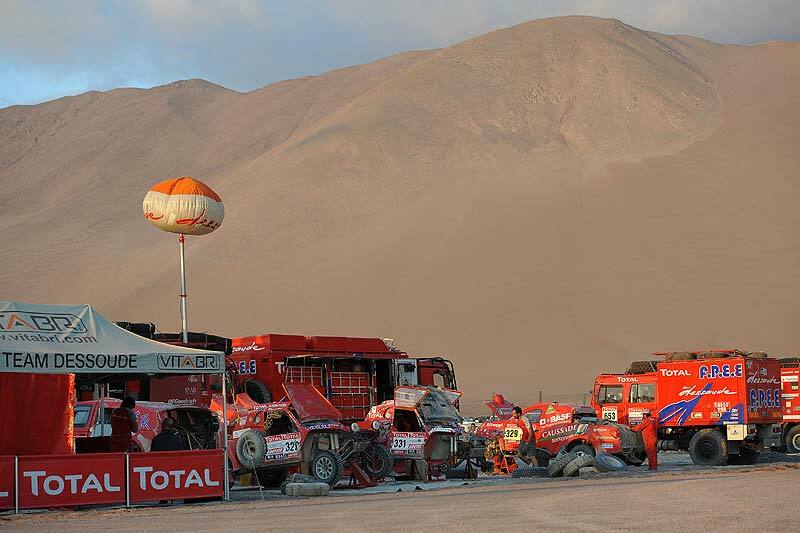 Welcome to the Dakar Rally 2012 special newssection. To read an article just click on the specific headline below. All articles are visible for several years and under special subdomain [ COPY & CLICK HERE ] or use the SEARCH. SA-Dakar Rally: Dessoude´s Zhou Jihong / Liao Min best Nissan after SS 13. 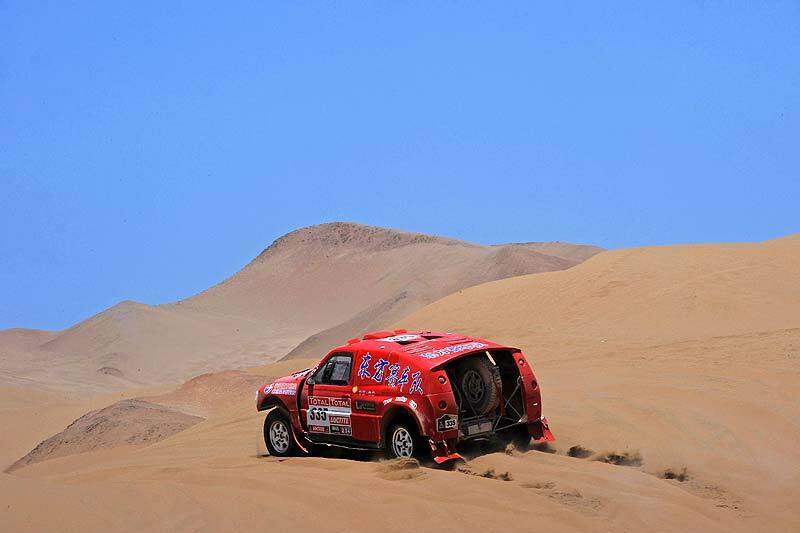 The 2012 Dakar caravan is closing in on its final destination. The 13th stage was once again redoubtable for the last three Dessoude Teams, both for the leaders and further down in the pack. 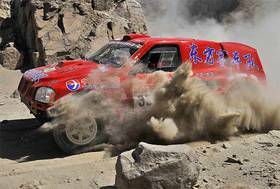 Although Thierry Magnaldi and Zhou Jihong got through without problems, Isabelle Patissier will remember this 13th stage for a long, long time. Once again, Thierry Magnaldi overcame these difficulties without too many problems, and set the 16th fastest time, despite not being in great shap. The driver from the Var is strengthening his third place on the two-wheel drive podium. In the Nissan Dessoude Proto, Zhou Jihong had a big fright when he lost a tyre, but luckily no real harm was done. He lost 15 minutes, and finished 21st on the stage - and is now the best Nissan in the race. But it was Isabelle Patissier who suffered the most between Nazca and Pisco, stuck for over two hours in a dip, mid-way through the stage. 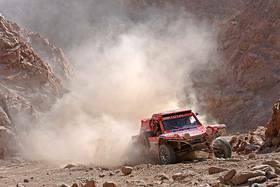 Already ill on Friday, Thierry Magnaldi had decided not to push Saturday, and to concentrate on holding on to the third place in the two-wheel-drive category for the Oryx Diesel Buggy. Arriving at the bivouac in 16th position, Thierry had only one wish: To rest and regain some strength for the final straight towards Lima. It was therefore his co-driver, François Borsotto, who looked back over the day’s events. "Thierry has not been in good shape since yesterday. He must have eaten something that disagreed with him, and he is nauseous, which is not nice while you are driving" told codriver Borsotto. "Moreover, the heat does not help at all. It should be noted that it 40°C in the shade! We started off this morning in the fesh-fesh, behind at least a dozen trucks. Due to the lack of visibility, we got grounded in a pass, just like Isabelle did. There was a real traffic jam, and sometimes the other vehicles nearly touched us. It was very close!" The leading Chinese drivers - and also leading Nissan, Zhou Jihong and Liao Min once again set the right pace and finished today in 21st position. The only issued today was a wheel to change at the 180 km mark. "We were driving well, keeping the right rhythm. Unfortunately, at the 180 km mark, crossing an erg, we came to an area where two cars were stuck. To avoid a collision, I had to turn quite abruptly, and as our tyres were very low on pressure, we lost a tyre. It took us around 15 minutes to change the wheel, and then we got going again, covering the kilometres with no problems until the finish line. We will be careful on the last stage, as even if it is a short one, no-one can guarantee that they will not have a problem. Next stop: Lima!" For the former freeclimbing world champion Isabelle Patissier and her friend and codriver Thierry Delli Zotti in their Oryx Buggy not the best day - they came to an abrupt halt half-way through the stage, trapped in a depression. A ‘spicy’ stage for the crew of the Oryx Buggy! "It was a real nightmare today" said Isabelle Patissier. " Everything was going well on the first part, until we got stuck in a dip. I really thought we would never get out of that hole. We literally had to fight centimetre after centimetre for two hours. The temperature was very high, and we were exhausted trying to get the Buggy out. We lost time and energy in the fight. The water in the cockpit was so hot that we were hesitant about drinking it." "Eventually, some Peruvians came to our assistance, by giving us some cold water and some peach juice. I don’t think I I have ever drunk anything quite go good! The physical effort was very intense during those two hours. To look on the good side, at least it took place today, towards the end of the rally. We already lost one plank yesterday, and we lost the second today. 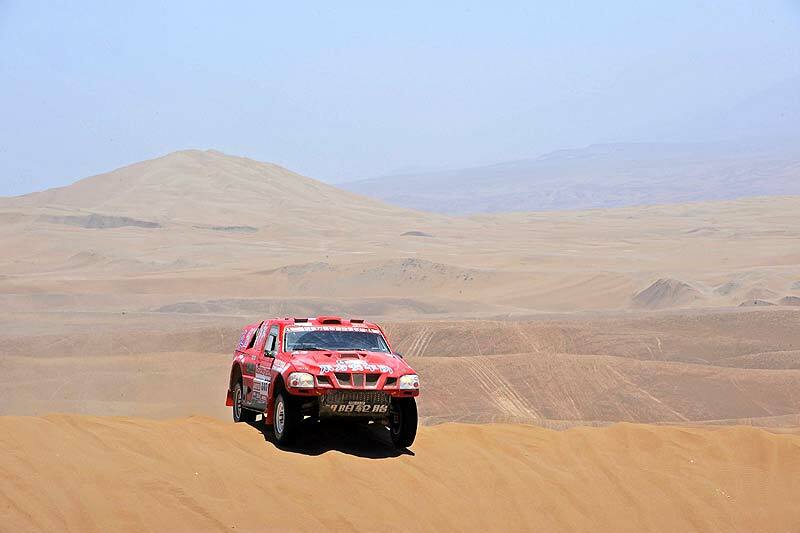 It’s definitely time for the 2012 Dakar to finish!"